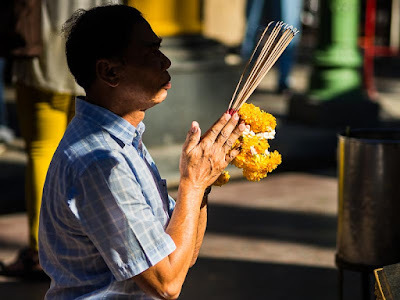 A man prays inside Erawan Shrine Wednesday. 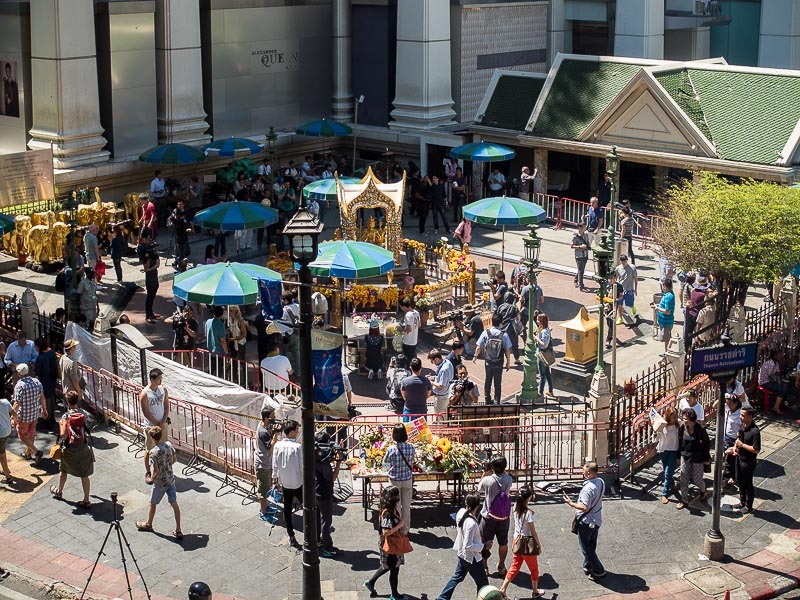 Erawan Shrine reopened Wednesday morning. It opened with little fanfare about 8.45AM. There were more journalists in the shrine than devotees. There were very few tourists. It was my first opportunity to see up close the damage done by the bomb. The only visible damage done to the Four Faced Buddha in the shrine was caused by shrapnel that blew off the chin on the face of one of the Buddhas. The fence around the shrine and gate to the shrine were badly damaged in the bombing, but in the shrine itself, there was surprisingly little damage. Families of the bomber's victim were among the first to visit the shrine. There were memorial services for them throughout the morning. Buddhist monks lead a service for families of the deceased. A family that lost loved ones in the bombing pray in the shrine. 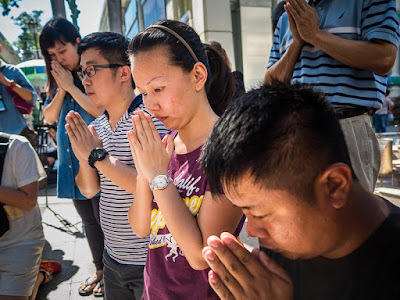 A Thai man who lost loved ones in the bombing prays in the shrine. 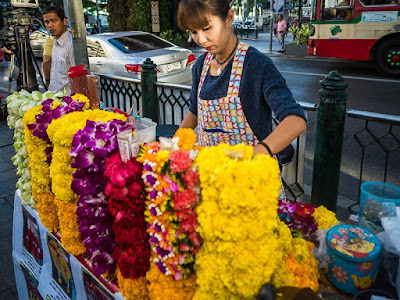 On the sidewalk in front of the shrine, the vendors were back, selling flower garlands left as offerings, religious paraphernalia and soft drinks. A vendor opens her stand in front of the shrine. 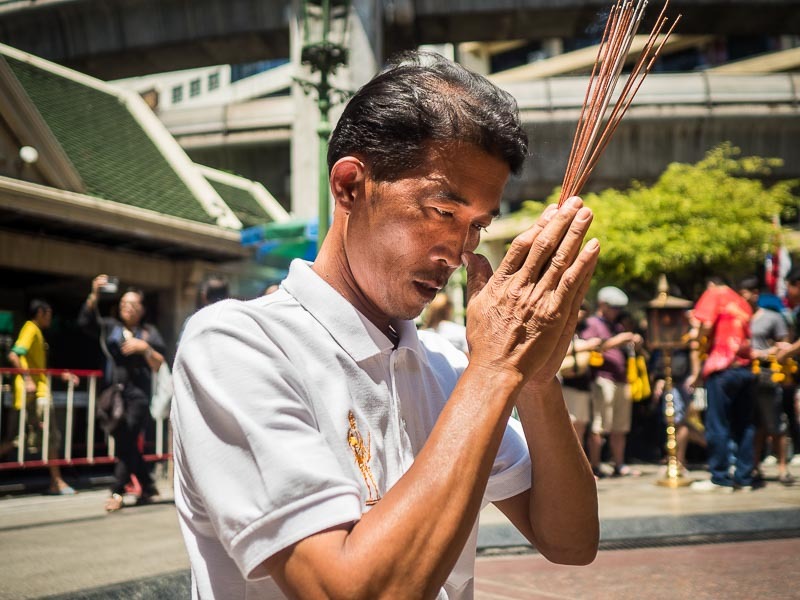 The shrine is one of my favorite places in Bangkok. 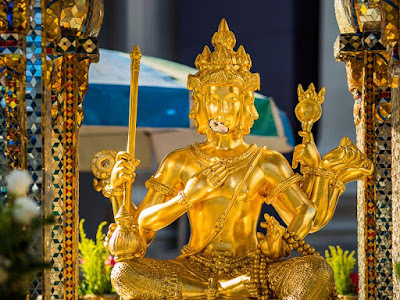 For me, it has always been the essence of Bangkok. The frenetic consumerism, ancient spirituality, the religious diversity (the shrine actually dedicated to the Hindu God Brahman, but most of the people who worship here are Thai Buddhists) all come together at Erawan Shrine. The shrine is not very big and first time visitors might say, "that's it?" but its importance and role in society are far greater than its physical size would suggest. Although there weren't many people buying garlands from the vendors, a sense of normality is returning to the area around the shrine. It will be a long time though before the shrine is truly back to "normal." 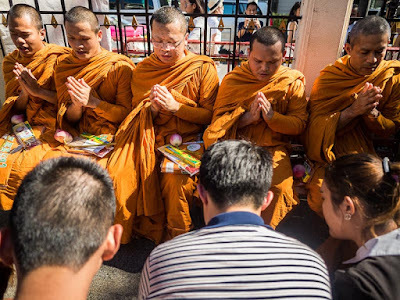 There are more photos from the reopening of the shrine in my archive or available from ZUMA Press.